Includes leg belt, fastening strip for the Cajon. 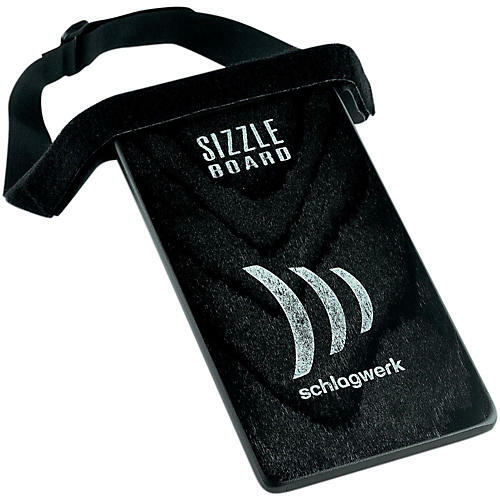 The Sizzle Board is an ingenious percussion accessory that can be played a number of different ways. It is first an excellent add-on for cajon players in that it can be strapped to one thigh as you are seated upon your cajon, and serve as a surface for tapping out shaker rhythms either with your hand or with a stick. With a stick, the beads inside rattle a little less, and behave somewhat like a hi-hat. With a a drum brush, you can take advantage of its mottled surface and realize a timbre soewhat similar to a brush working on a snare drum head. You can additionally use it as a handheld shaker, and realize maraca rhythms. A really cool hand percussion accessory, really well made with a pleasant timbre. Order today and expand the scope of your percussion playing.